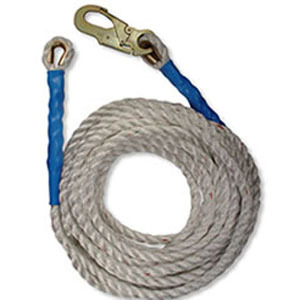 100' Vertical Lifeline is constructed with 5/8", 3-strand polyester rope. Features a double-locking snap hook and steel thimble at the anchorage end, and a steel thimble at the trailing end. •5/8" Polyester rope has a tensile strength of 8,500 lbs. •Superior resistance to abrasion and UV light. •Five-tuck splice for superior strength and safety. •Exclusive steel thimble resists wear and extends the life of the line. •Protective PVC shrink tubing protects the spliced end.